Considering the purchase of a Paediatric Profiling Bed? Hire a Paediatric Profiling Bed from us for as long as you require giving you the peace of mind that this is going to fulfil your needs. If after you have tried the hospital bed you would like to purchase one then we will allow you up to 1 weeks of the hire discounted against the purchase. Plus if you wish to purchase the hospital bed we have delivered to you on hire then you will also benefit from a further 20% fleet discount off of the retail price. 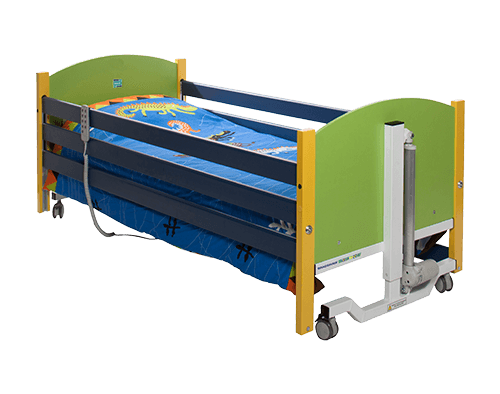 The paediatric profiling bed is a bright and attractive bed designed to meet a comprehensive range of requirements for children. This bed’s electrically operated profiling action enabling backrest and knee break sections to operate in harmony, reducing pinching to the sacral area. Electrically operated fully profiling paediatric care bed.